Colorado’s mountains have plenty of activities to get your heart racing, but they’re also perfect for kicking back. Dip into our many hot springs, where you can soothe sore muscles after a long day of hiking or skiing. Many also offer water slides and kid-friendly amenities. This luxury resort boasts more than 20 soaking pools (including the world’s deepest geothermal spring), a full-service spa and salon and a separate luxury suites hotel, which is LEED-certified for its environmentally conscious design. Unwind in one of the five adults-only pools, which have sweeping views of the San Juan Mountains. Surrounded by Gunnison National Forest, this remote lodge is an ideal getaway for horseback riding, fishing and swimming in the hot-springs-fed pool. This family-friendly ranch also includes kid-appropriate activities like hayrides, horseshoes, fishing and more. This lodge is perfect for the entire family, boasting the world’s largest hot-springs pool, two water slides and a mini-golf course. Escape to the resort’s full-service spa, where you can enjoy a soothing massage in their historic, sandstone bathhouse. Stay in a private log cabin overlooking the Rocky Mountains and enjoy 24-hour access to three secluded hot-springs pools. This pastoral 36-acre ranch also features hiking trails, a stocked fishing pond and private riverfront access. This complex touts eight geothermal pools, water slides, a fitness center, tennis courts, massage services and childcare. Book a private cabana on the upper deck to make a full day of it. Book one of the historic accommodations in this European-style lodge and take a breather with an Aveda spa treatment and a dip in the therapeutic hot springs. Unwind in the natural vapor cave, which includes a 108-degree soaking pool. Surrounded by towering mountains and lush forests, a series of natural hot-springs pools are an inspiring place to bring your whole family. The shallow pool is ideal for young swimmers and features a water volleyball area, while the activity pool boasts an inflatable obstacle course. For more relaxation, seek out the hot pool or the infinity-edge overlook pool. Variety rules with geo-thermal caves, private baths, outdoor Jacuzzis and a mineral water pool, not to mention lodging options that range from campsites to resort rooms. Visit the spa, where you can get the Maize Salt Glo Treatment, a massage and exfoliation with corn maize, magnesium and castor oil. This luxurious mountain resort boasts numerous geothermal springs. Its proximity to Monarch and Ski Cooper ski areas makes a perfect aprés-ski muscle relaxant. Thirty small pools are located right in Chalk Creek, which runs alongside the property and adds a super-natural feel to your soak. 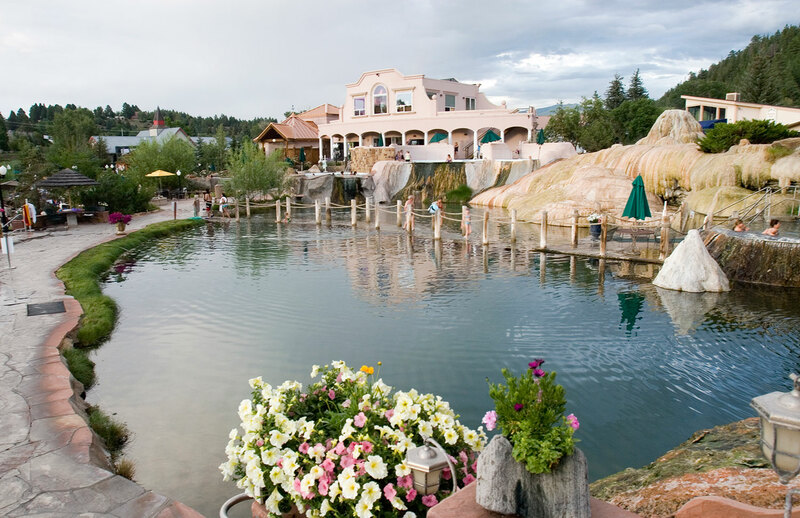 This resort’s waters, which run in the town of the same name, have been flowing from seven natural springs for hundreds of years and were used for healing by the Ute Indians. Hop from pool to pool to try out different temperatures and views. Seven pools in this San Juan Mountain paradise range from 98 degrees to the very steamy — and appropriately named — Lobster Pot, which can get up to 114 degrees. The unique gravel-bottom “pond” is known for Mount Sneffels vistas and massaging waterfalls. This all-inclusive resort is set in a restored ghost town, featuring private log cabins, mineral-rich hot springs and long-table dinners held in an 1800s saloon. Enjoy the soaking pool inside the restored 19th-century bathhouse or venture to Colorado’s only geyser, which is located nearby. Roof-top tubs, five indoor pools and one completely private tub give you options for any weather or occasion. Sunset Magazine recently named this hot springs, tucked inside a Victorian-era storefront, a great aprés-ski option just half an hour from Wolf Creek Ski Area. With lodging options spanning an RV park to rooms and suites with full kitchens as well as a spa, Healing Waters makes sure you don't need to leave the grounds for a relaxing getaway. Consider an Aquastretch treatment in one of the warm-water pools to soothe weary muscles. Situated in a peaceful courtyard beneath a scenic mountainside with 360-degree views, the Box Canyon Lodge's hot-springs tubs are available only to overnight guests. Frequent guests recommend taking in a San Juan sunrise on the lodge's bench swings. Relax in the sauna, swim laps in the massive naturally heated mineral pool, picnic and sunbathe poolside and soothe the body and soul with massage treatments. There are a couple of lodging options for those who just can't tear themselves away from the geothermal waters. This non-profit, clothing-optional, off-the-grid spot is a unique way to experience the land of the San Luis Valley. Several all-natural soaking ponds are found along wilderness trails, while a hot tub and sauna are heated geothermically and hydroelectrically. Reservations strongly recommended. This San Luis Valley gem pulls its 140-degree artesian mineral waters from beneath the Sangre de Cristo mountains. Pools are gravity-fed and cooled to a comfortable and relaxing 98 to 110 degrees. Unique lodging options can be found in the yurt and a tiny tipi village. Nestled amid Colorado's Collegiate Peaks mountains, this hot springs comes with a three-bedroom home that can accommodate 12 people for private enjoyment of the area's mineral-rich waters. Massage therapists are available for house calls, so you can get all the relaxation of larger resorts. With a private hot-spring tub next to burbling Chalk Creek, this cozy three-bedroom vacation rental is as peaceful as it gets — when the sun goes down and the stars come out, there's a remote, majestic feeling you can't shake. Right inside San Isabel National Forest along Chalk Creek, Antero's three cabins each come with their own hot-springs-fed pools and spectacular mountain views. Schedule a visit with the massage therapist and sign up for a hot herbal wrap or private yoga instruction. This publicly operated indoor pool has room for laps, fitness classes, arthritis pool therapy, a water slide and other activities. There are also private soaking pools, which can be reserved in advance. Stay on site in a Cottonwood Creek-side cabin or the lodge right in the Collegiate Peaks mountains or just come for the day. Several pools range in temperature from 94 to 110 degrees and spa services are available, as are the sounds of the creek rushing by. Iron Mountain Hot Springs, which opened in July 2015, is located on the site of the historic Iron Springs Spa on the banks of the Colorado River in Glenwood Springs. The resort offers a freshwater family pool with an elevated whirlpool spa and 16 smaller mineral hot-springs soaking pools that complement the scenic hillside landscape next to the river. With a mountain-view outdoor pool and two soaking tubs — one indoors, adults-only and one outdoors — you can choose the perfect atmosphere for your float. With amenities like spectacular breakfast, a tiki bar and easy access to Jeep rentals, this is the perfect Ouray retreat. This spot 20 miles west of Craig has just recently opened to the public but has been warming the area's residents for centuries. Its waters contain 24 beneficial minerals — only two others in the world can boast of this richness. The pools range from 80–103 degrees, and camping and day-use shade tents add to the relaxing, low-key vibe. Tucked along the banks of the Crystal River, this primitive spot is a short hike from Hwy. 133. About 12 people can fit in the pool, which is sectioned off from the river by large rocks. This geothermal outdoor swimming pool is popular with families in the San Luis Valley near Great Sand Dunes National Park and Preserve, with slides, a diving board, floats, a snack bar and grassy area for picnics. Just a half hour's drive from the Royal Gorge in Cañon City, this hot spot is a little gem that feels as if it's in the middle of nowhere — which tells you something about the unfettered views. Open year-round, this outdoor facility features a family pool and therapy pool just 20 miles from Alamosa. There's also an indoor adults-only greenhouse with a variety of pools, plans and adult beverages.